Christina Stembel and I were guests of the California Cut Flower Commission’s Monterey Bay event in June. 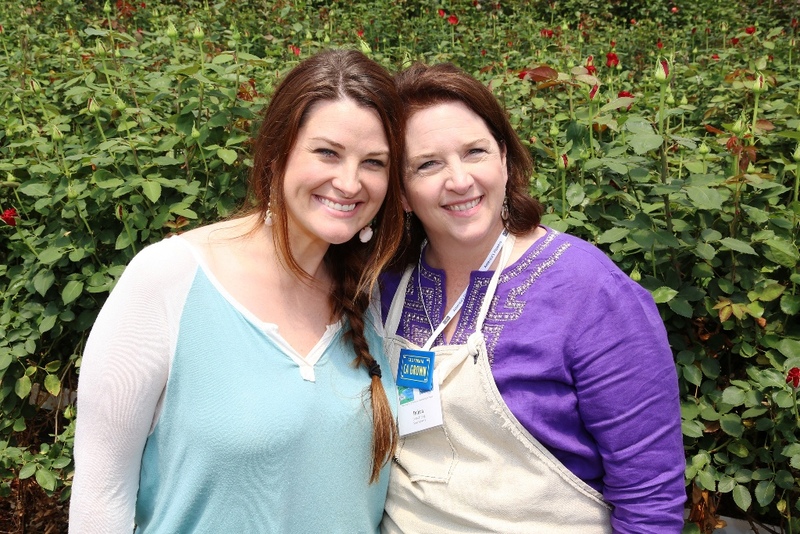 We were photographed on a tour of Pajarosa Roses, a wonderful source for cut roses. If the term “imitation is the highest form of flattery,” then my friend Christina Stembel has been over-flattered, multiple times. 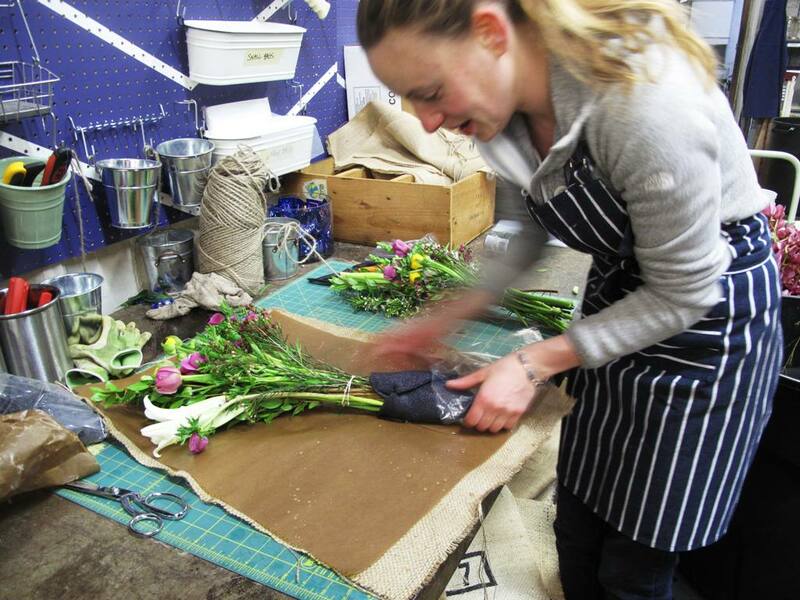 Meet Christina Stembel at her SF Flower Mart stall, which is where all the beauty happens! The creator of Farmgirl Flowers in San Francisco, Christina has poured considerable heart, soul and personal resources into developing her innovative floral design business. Customers and the media have responded enthusiastically (see Martha Stewart Living). And her reward in part has been the explosion of copycat businesses, not just in the Bay Area but in other major cities around the country. 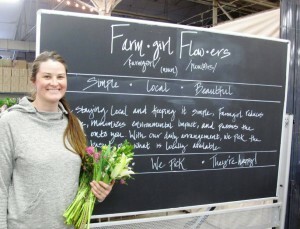 That’s the downside of being a successful and creative business like Farmgirl Flowers. But to me, the upside for Christina is that no one can imitate her personality or character. People can try, but they never will be the original. 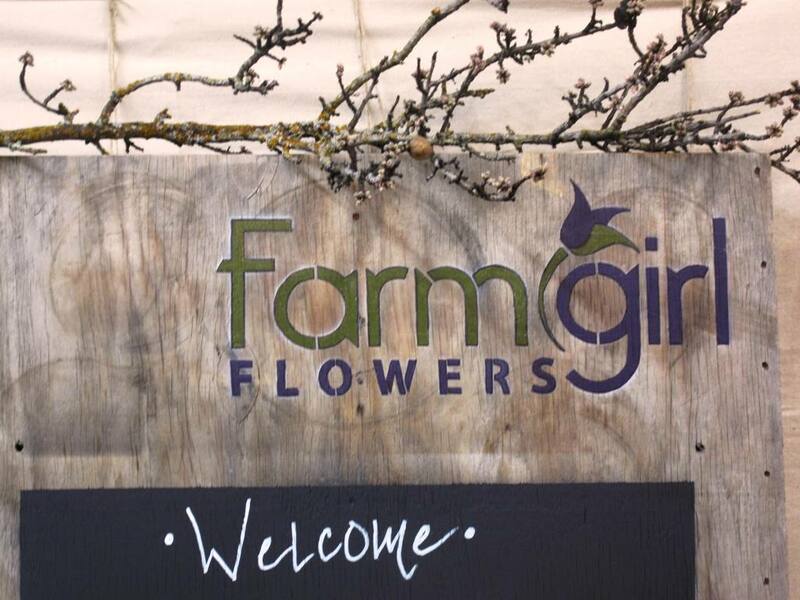 I’m Christina, also known as the farm girl behind Farmgirl Flowers. I grew up on a farm in Northern Indiana, and while I set my sights on leaving the farm for big dreams in New York City, I now appreciate more than ever my farm upbringing. Ten years ago, after moving around a bit, I settled in the Bay Area and, like so many others, decided to make it home. In the past, ahem, years, I’ve had the privilege of working in many industries, mostly in hospitality and event planning. Pretty quickly, I noticed an exorbitant amount of money was spent on flowers. So, I started doing my own arrangements and realized tremendous savings along the way. Now, being the overly curious individual that I am, I wanted to know just why do flowers cost so much? I started researching the reasons and came to some pretty startling conclusions. The flower industry has gone through a very tumultuous time in the past 20 years, and is pretty much in the same boat as the industries that numerous documentaries have been made about in recent years (ie: textiles, coffee, technology, etc). What used to be a big domestic business is now being whittled away due to imports. I had no idea that 75% of our flowers were being shipped in from other countries. It just didn’t make sense to me when over 75% of the domestic supply is grown right here in California. I don’t want to bore you with more stats – hopefully you see where this is headed. The bottom line is that local farmers are going out of business left and right because they can’t compete with the prices of flowers imported from South America and other countries. And, normal people like me can’t afford to send flowers to friends and loved ones because it ends up costing an absurd amount of money. Not to mention all of the environmental damage caused by flying flowers across the globe – they have to be shipped in chemicals just to make it to your door. And, another huge source of waste is having so many choices of flower arrangements. 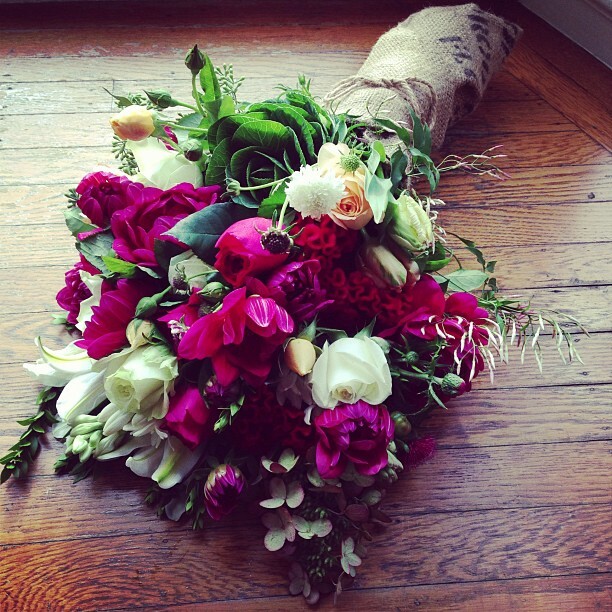 As a result of this approach, a huge percentage of flowers end up as waste, and are never even sold! We’re making our landfills so beautiful, but, really, isn’t there a better way? I thought so, and devised a plan to fix the problems that have caused the inflated prices and high environmental impact, which is how Farmgirl Flowers was born! What’s that saying about being able to take the girl out of the country, but not the country out of the girl? 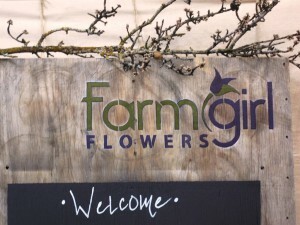 There’s a charming vibe at Farmgirl Flowers, down to the logo and signage. One of the designers who works for Farmgirl Flowers wraps a bouquet at the studio. 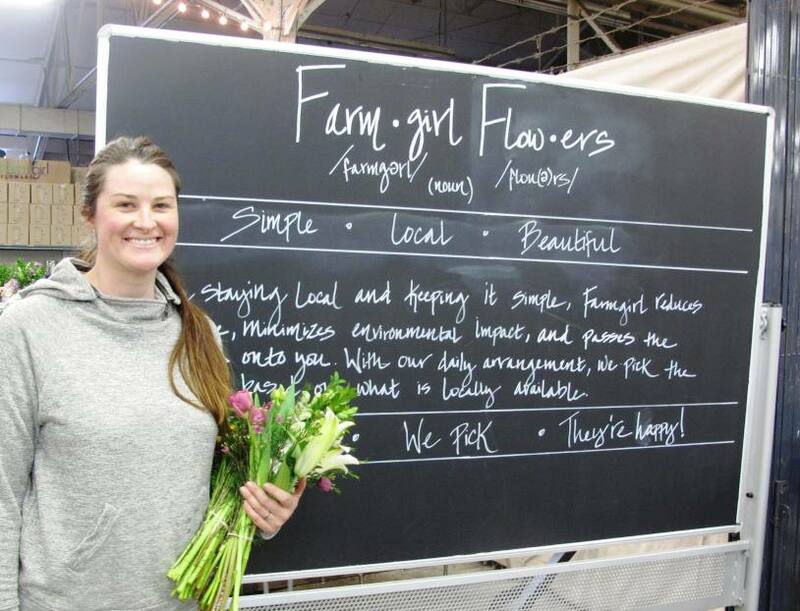 Click on the “Why we’re different” page at Farmgirl Flowers where you will see a chart comparing the LOCAL bouquets Christina and her staff design with wire services, aka “the competition.” It’s amazing when you look at these very different business models side-by-side. Here’s a link to the Podcast Episode 101, in which Christina Stembel of Farmgirl Flowers and I joined Sunset Magazine’s Kathy Brenzel to discuss the Local Flower Movement. The Slow Flowers Podcast with Debra Prinzing is edited and engineered by the very talented Hannah Holtgeerts of HH Creates. Check out her web site here. This entry was posted on Wednesday, September 25th, 2013 at 4:31 am	and is filed under American Grown, Blog Posts, Creativity, floral design, General, Playfulness, Podcast Episodes, SLOW FLOWERS Podcast, Writing. You can follow any responses to this entry through the RSS 2.0 feed. You can leave a response, or trackback from your own site.